The boundless energy and stamina of our supporters never ceases to amaze us! We're so grateful for all your support. Liam wanted to help make a change for sharks. So he walked 5 km along Cromford canal to raise money for us. Liam made this decision to #DoSomeFin a few weeks before he did his challenge. In a few weeks Liam decided on his challenge and raised an incredible £274! The Marine Institute at Plymouth University raised £120 in February. Instead of having bags of goodies at a student conference they decided to go without and raise funds for the Shark Trust. Two high school students from Shepherd's Hill Academy raised £55 as part of an economics class. William, Felix and Harry held a bake sale after reading an article in First News about the threat to sharks and the work we do. They raised a total of £96.26. Jed Sharmel donated £50 because he loves sharks. Mrs Du Preez made a £100 donation. Eva, Nikki, Emily B, Emily M and Hermione (‘Animal Rescue Club’) held a cake sale raising £100. Regular Shark Trust fundraiser, Gracie, raised another £140. Andreas Weerasooriya donated £50 because he wants his daughter to grow up in a world where we still have sharks. Mary Sanche donated £44.40 raised from the sale of a painting. Brooke Clifton raised £100 by asking for donations instead of gifts for her 8th birthday. Caleb Entwistle (aged 6) raised £600 by running the Scottish Borders Ultra Marathon - that's 38 miles in total! He broke this up into smaller runs over October. Caleb loves sharks and would like to work with them when he grows up. Melanie Coath donated £45 on behalf of her 4 year old who loves sharks so much that instead of party bags they asked for donations. Klaire Jamin made a donation of £45. Sophia Fielding also raised £305 running for sharks in the Manchester Half Marathon. Sophia's 6 year old daughter is fascinated with sharks and watches no end of documentaries about them! Through her and these documentaries she learnt how crucial sharks are to a healthy ocean and how magnificent they are. Louise Orgill made a donation of £50. Rebecca Cockeram ran the Cardiff Half Marathon for sharks raising £259. Danni Hill ran the Plymouth 10K for sharks raising £80.90. Tom Baston ran the Plymouth 10K for Sharks raising £252. "As a marine biologist I wanted to bring more attention to the Shark Trust and inspire those around us in UK to have more interest and respect for UK seas and the life in it. You would be surprised what you would come across in Plymouth Sound... "
Anna Katz donated £50 - In memory of Miles Jenness a 5 year old shark lover who passed away on 29th September. NSA Radet made a donation of £5. Sam Hodge £50 in support of Alexander Chau's book The Black God. Cahl organised a fun day fundraiser and invited everyone from his school. There were shark fin cakes, leaflets, an A-Z shark quiz, badges and talk from Cahl about sharks. Cahl raised £100 on the day for the Shark Trust. Cahl said 'I am a shark lover and I feel like sharks are magnificent creatures that should be protected'. Aliz ran the Great Bristol Half Marathon in September raising £176. 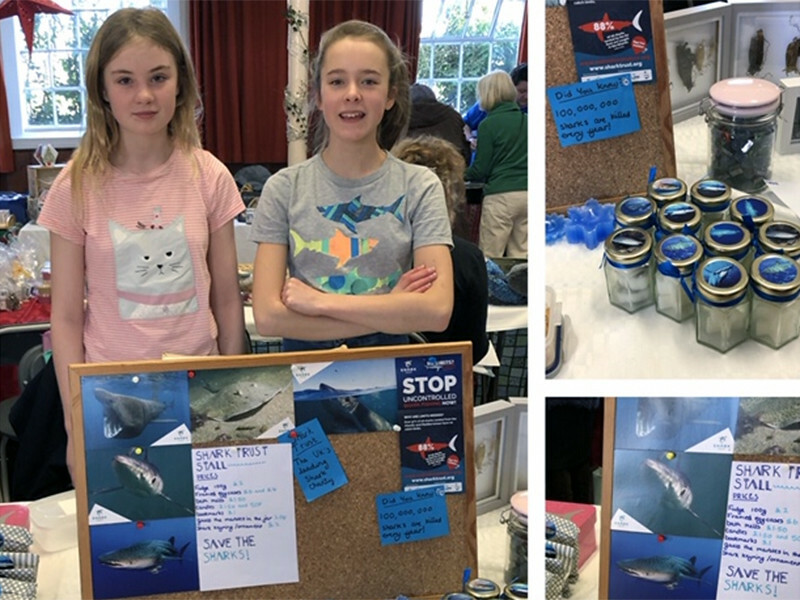 Aliz said 'I decided to run for Shark Trust to raise awareness of these incredible yet misunderstood animals and the important role they play in the whole marine ecosystem'. We've organised a range of fundraising events around the country. Find an event near you and join us to #DoSomfin for Sharks! Find out what our current fundraisers are up to. And support them by making an online donation. How do I send you the money I've raised?